As with many plants it is best to plant the seed and grow them in place without having to transplant them. Sabal palmetto is a perfect example. This method makes for a hardier tree with a naturally wide spread root system. But because of the time required to grow a considerable size Sabal, especially far from its native range, we resort to digging native ones from the wild. We can obtain large trees instantly like this but not without some obstacles to overcome. Due to the fact that Sabal palmetto roots die back to the main stem when cut, it is recommended that all leaves be removed to aid in the recovery of the root system and establishment of the transplant. The removal of the leaves is commonly referred to as "Hurricane Cut" This is hard for some folks to deal with since they want an instant big tree they also want instant leaves. But many trial plantings have shown that under most planting conditions this is the best method to use to establish the transplant. Another method of establishing transplanted Sabals is to pot them in large containers and let them establish a root system and re-grow some of their leaves before placing it in the landscape. This is also accomplished somewhat by heeling them in still in their rootwrap. A few roots penetrate the wrap but many form and stay inside the wrap just like they do in the pot. Container grown ones would give a head start in cooler areas with shorter growing seasons where palmettos are trying to be established. When selecting a transplant, it is better to select one that has just been dug or has been heeled-in in the soil until planted in it's permanent location. Most transplants now have the rootballs wrapped to help hold moisture next to the trunk for better root regeneration. Observations in Florida have established that there may be young roots initiating from the stem when dug. This wrapping helps ensure their survival. For best results Sabals in the nursery or sales yard should be heeled-in with rootball wrap still in place. The palms should be watered almost daily with overhead irrigation in sandy soil while waiting to go to their permanent locations. Discontinue overhead irrigation with the advent of cold weather. 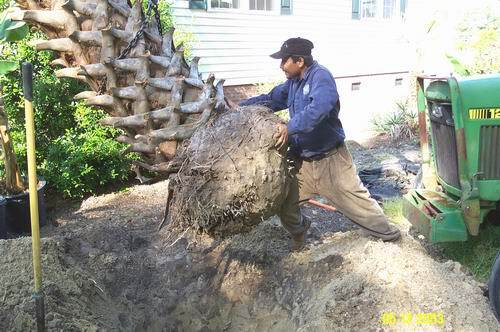 When planting in their permanent location dig a large hole to accommodate the rootball and to allow the soil to be washed back in around it. 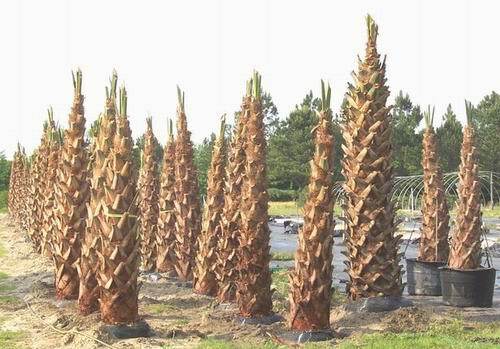 Sabal palmettos grow in a wide range of soils in habitat so they are not that fussy about needing soil amendments if good fertilizer and plenty of water are applied. 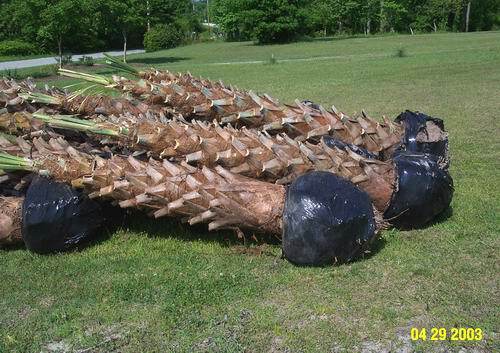 Although Sabal palmetto can sometimes be planted deeper and survive, it is recommended to plant them at the same depth they were originally growing. The fully recovered Sabal palmetto in the photo at the bottom of this page is growing in very sandy soil with no amendments. As the soil is put back in the hole water is applied to wash it in. Probe the soil with shovel handle as the water and soil is placed in the hole to eliminate all air pockets. 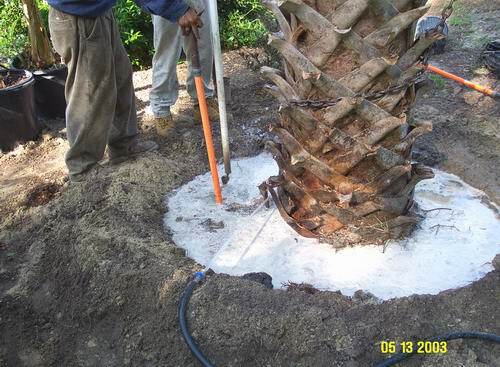 Leave a watering ring made of soil around the palm root area to hold water while it drains down into the rootball. Water everyday or so for the first month in well drained soil. Be careful not to over-water in poorly drained soil to the point that the rootball in standing in water. Then in hot weather three or so good soakings a week after that in warm weather is normally sufficient. No need to fertilize immediately as there are no major roots to utilize it. In warm weather light fertilization could start after about a month. The following spring normal rates of fertilizer can be applied based on package rates. A fertilizer with equals parts nitrogen and potash and one that has a a good amount of trace elements has worked very well. Very tall palmettos may need to be braced for high wind conditions for the first season. In areas out of it's native range Sabal palmetto transplants may benefit from some form of protection for the first few years until fully established. An easy inexpensive way to protect the growing point of the palm is to wrap the top couple of feet of the trunk with Christmas lights. These should only be used on nights when extended temperatures in the low teens or lower are apt to occur and turned off at higher temperatures. A wrap of burlap will also aid in retaining heat. This was a six foot hurricane cut palmetto five years before this photo was taken here in inland eastern NC. The palmetto has a full head of leaves and is very healthy due to proper fertilization and watering. In warmer areas recovery and growth can be even faster. It is better to plant palmettos in warm weather especially in areas out of their native range. I have actually seen palmettos planted in June and July catch up to and pass palmettos planted in April here in inland areas of NC. It has also been noted by some in Florida that the minimum trunk size of a Sabal palmetto should be at least four feet for best results.